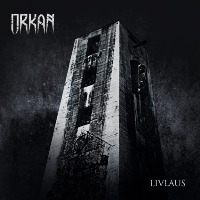 Norwegian-based Black Metal outfit ORKAN is back again, unleashing their sophomore album “Livlaus” onto the unsuspecting world. With a three year wait since its predecessor, this really was one of the more anticipated underground releases in 2015. And indeed, with past musicians from bands such as BYFROST and TAAKE in the lineup, my expectations of this album were very high, but ORKAN certainly do not disappoint with their second album. Although “Livlaus” is unquestionably quintessential Black Metal, other influences are woven in, ranging from Thrash to almost Black ‘n Roll elements. Right off the bat with “Fanden På Veggen”, it becomes immediately apparent that this is not your average run-of-the-mill Black Metal album, with a mid-pace song with odd tempo changes interlaced with weird little unexpected twists in the melody. The vocals are used sparingly as a counter point to the instrumental sections, allowing the effects and textures to take the fore, whilst understated screams linger in the gloomy background, giving everything a hair-raising eeriness. And like a flick of a switch, “Brende Bruer, Svart Metall” launches straight into what can only be seen as the polar opposite: fast, aggressive, and savage, thus providing the perfect juxtaposition for the melancholic-tinted dirge-like “Livlaus Del 1: Evig”. And just as you start thinking you’re getting a feel for the album, you’re struck by the powerful, roiling, and majestic beauty of “Livlaus Del 2: Dødens Dal”; undeniably one of the highlight of the album for me. “Uforgjengeleg” on the other hand has a bit of that unique TAAKE flavour to it, although this by no means is to suggest that ORKAN are riding coat-tails: no one can claim that “Livlaus” is lacking in originality. Guest vocal performances by Hoest of TAAKE and V’Gandr of HELHEIM further help to diversify the already great variety found in this album, making it a treasure-trove of hidden gems from beginning to end.